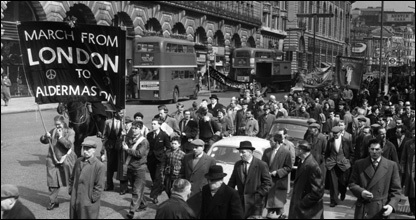 It had its first public outing 50 years ago on a chilly Good Friday as thousands of British anti-nuclear campaigners set off from London's Trafalgar Square on a 50-mile march to the weapons factory at Aldermaston. The demonstration had been organised by the Direct Action Committee Against Nuclear War (DAC) and the Campaign for Nuclear Disarmament (CND) joined in. He considered using a Christian cross motif but, instead, settled on using letters from the semaphore - or flag-signalling - alphabet, super-imposing N (uclear) on D (isarmament) and placing them within a circle symbolising Earth. The sign was quickly adopted by CND. "He thought peace was something that should be celebrated," says Mr Kolsbun, who has spent decades documenting the use of the sign. "In fact, the semaphore sign for U in 'unilateral' depicts flags pointing upwards. Mr Holtom was all for unilateral disarmament." In a book to commemorate the symbol's 50th birthday, Mr Kolsbun charts how it was transported across the Atlantic and took on additional meanings for the Civil Rights movement, the counter-culture of the 1960s and 70s including the anti-Vietnam protests, and the environmental, women's and gay rights movements. He also argues that groups opposed to those tendencies tried to use the symbol against them by distorting its message. How the sign migrated to the US is explained in various ways. Some say it was brought back from the Aldermaston protest by civil rights activist Bayard Rustin, a black pacifist who had studied Gandhi's techniques of non-violence. 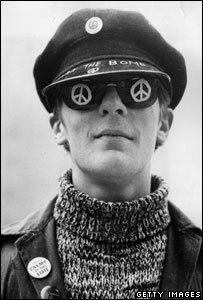 In Peace: The biography of a symbol, Mr Kolsbun describes how in just over a decade, the sign had been carried by civil rights "freedom" marchers, painted on psychedelic Volkswagens in San Francisco, and on the helmets of US soldiers on the ground in Vietnam. "The sign really got going over here during the 1960s and 70s, when it became associated with anti-Vietnam protests," he told the BBC News website. 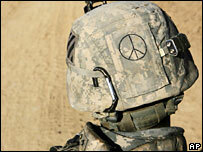 As the combat escalated, he says, so did the anti-war protests and the presence of the symbol. "This, of course, led some people to condemn it as a communist sign," says Mr Kolsbun. "There has always been a lot of misconception and disinformation about it." 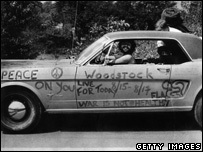 As the sign became a badge of the burgeoning hippie movement of the late 1960s, the hippies' critics scornfully compared it to a chicken footprint, and drew parallels with the runic letter indicating death. In 1970, the conservative John Birch Society published pamphlets likening the sign to a Satanic symbol of an upside-down, "broken" cross. 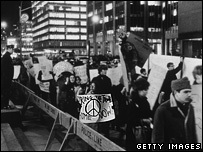 While it remained a key symbol of the counter-culture movement throughout the 1970s, it returned to its origins in the 1980s, when it became the banner of the international grassroots anti-nuclear movement. The real power of the sign, its supporters say, is the reaction that it provokes - both from fans and from detractors. The South African government, for one, tried to ban its use by opponents of apartheid in 1973. And, in 2006, a couple in suburban Denver found themselves embroiled in a dispute over their use of a giant peace sign as a Christmas wreath. The homeowners' association threatened them with a daily fine if they didn't remove it. The association eventually backed down because of public pressure, but a member told a local newspaper it was clearly an "anti-Christ sign" with "a lot of negativity associated with it.". CND has never registered the sign as a trademark, arguing that "a symbol of freedom, it is free for all". It has now appeared on millions of mugs, T-shirts, rings and nose-studs. Bizarrely, it has also made an appearance on packets of Lucky Strike cigarettes. A decade ago, the sign was chosen during a public vote to appear on a US commemorative postage stamp saluting the 1960s. The symbol that helped define a generation of baby boomers may not be as widely used today as in the past. It is in danger of becoming to many people a retro fashion item, although the Iraq war has seen it re-emerge with something like its original purpose. "It is still the dominant peace sign," argues Lawrence Wittner, an expert on peace movements at the University at Albany in New York. "Part of that is down to its simplicity. It can be used as a shorthand for many causes because it can be reproduced really quickly - on walls on floors, which is important, in say, repressive societies." And can its success be measured? Fifty years on, wars have continued to be waged and the list of nuclear-armed states has steadily lengthened. But the cup is half-full as well as half empty. "There are many ways in which nuclear war has been prevented," says Mr Wittner. "The hawks say that the reason nuclear weapons have not been used is because of the deterrent. But I believe popular pressure has restrained powers from using them and helped curbed the arms race. And the symbol of and inspiration for that popular pressure, says Mr Wittner, is Mr Holtom's graphic. Peace: A biography of a symbol is published by National Geographic Books in April. It is amazing how we sometimes take an iconic symbol for granted without questioning how it came to be! Reading this story gives a greater insight into what the symbol represents and also makes me ponder on how often we are 'blind' to the most frequently seen objects around us! The peace sign is actually a Hopi Indian sign for unification between tribes, derived from the footprint of a crane, the Bird of Heaven. Here in the San Luis Valley, where I live, the cranes migrate every spring in March. The logo was in use long before 1958 - as an SS regimental symbol, for instance. What a nice story. Unfortunately the sign was in use rather earlier, notably on the graves of SS soldiers in WW2. Presumably Holton was not a very aware designer. In 1968, we painted a bright white in colour peace sign on a mountain in the Las Vegas valley. With a diameter of 110 feet is was visible from miles away. It is still visible (barely) when viewed on Google earth. It is fascinating to know the meaning and history behind the symbol. As a Vietnam veteran, I never wore it during the war, only afterwards, next to my badges and medals, a peace sign. Only a soldier knows the true cost of peace. Every citizen of the world should live in peace. Every person in the world must play their part. In the words of the late, great John Lennon, "Give peace a chance"!